Thanks to a deluge of press releases we already knew that when Phil and Paul said that Alberto Contador was “dancing on the pedals,” they didn’t mention how special the pedals were. Alberto was rocking the new Look Keo 2 Max in super-champion yellow, and they’re lust-worthy. Look pedals have always been among our favorite, and we’re looking forward to taking a look at these new stompers. 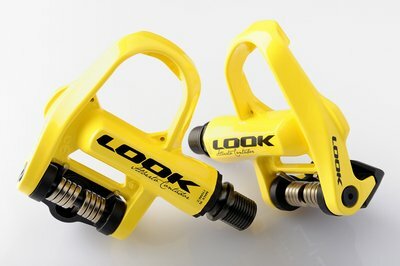 The pedals have a 12-percent greater surface area (compared to the previous Keo), oversized axle, carbon injected body and they weigh in at 120 grams. It’s unlikely we’ll see Alberto’s pedals in the local bike shop, but their black counterparts will be available.